This page contains information about planning and building, including architectural review, for the Prince Frederick Town Center. For information on the architectural review process and the Prince Frederick Architectural Review Committee, visit the Architectural Review page. View conceptual drawings and traffic study information, on the proposed Armory Square project that includes the former Calvert Middle School property. 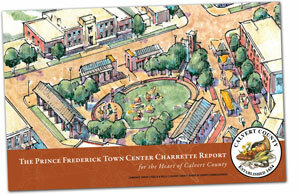 The county government is working to update to the Prince Frederick Town Center Master Plan. Your informed participation is essential to success! Calvert County government has embarked on an exciting design and master planning project for the Prince Frederick Town Center. The goal is to update the Prince Frederick Town Center Master Plan and Zoning Ordinance, adopted in 1989. The "charrette," a public visioning and design process, provided opportunities for people to share their ideas for the future of Prince Frederick. The charrette report is full of thought-provoking ideas, which are being considered for inclusion in the new master plan and zoning ordinance.